Naushad Ali, last monarch of the musical empire, died leaving behind a treasure trove of songs seeped in poetry. Right from Prem Nagar (1940) to Taj Mahal- An Eternal Love Story, he enriched Hindi film music with the timeless intensity of his compositions. Wahid Ali was a munshi in the court in Lucknow and he wanted his son Naushad Ali to do something similar, but young Naushad's mind was musical. He began his career repairing harmoniums in Lucknow. Wahid Ali felt that his community would not appreciate the fact that his son had taken up music to earn a livelihood. On Divali, he berated Naushad and told him to choose either music or home. Naushad walked out of his home, saying, "Aapko aapka ghar mubarak, mujhe mera sangeet." After he came to Bombay he had to struggle a lot. He even slept on the footpath in Dadar. He assisted Ustad Jhande Khan and Khem Chand Prakash and became a full-fledged music director with the unremarkable Prem Nagar (1940). However, Akhiyan mila ke jiya bharmake chaley nahin jana and Milke bichad gayee aakhiyan from Kardar Production's Rattan catapulted him to fame. Jawan hai mohabat, Mere bachpan ke saathi mujhe bhool na jana, Aawaz de kahan hai... were chiselled by Naushad for Noorjehan's bass voice in Anmol Ghadi but Suraiya vied with Noorjehan with her Socha tha kya kya hogaya... With the popularity of these numbers, sky was the limit for him. From day one, while composing for films, Naushad wanted to popularise the Indian folk and classical music. The score of Baiju Bawra was a step towards that end. Seasoned classical vocalists D.V. Paluskar and Ustad Amir Khan sang along with Mohammed Rafi and Lata Mangeshkar. Lata was so overwhelmed by the tune and lyrics of Mohe bhool gaye sanwariya that she broke down in the middle of the recording. Who can forget Meena Kumari's embarassed expressions in Tu ganga ki mauj? Naushad never felt tired of telling one and all that the songs Man tadpat Hari darshan ko aaj, O duniyan ke rakhwale sun dard bhare more naley, Insaan bano karlo bhalayee ka koi kaam were perfect examples of national integration. On the day of premier of Baiju Bawra at the Broadway Theatre in Dadar, the producer asked Naushad how did he feel. Looking to the other side of the footpath where he used to sleep when he came to Bombay, with a lump in throat, he remarked, "Janaab, us footpath se yahan tak aane mein 16 saal lag gaye". Naushad’s tunes came straight from the heart and he agonised over tunes and phrases, spent sleepless nights and worked until he achieved perfection. According to Naushad, his life's best was created in Mughal-e-Azam. The biggest challenge he had to face was to get the audience to tear its transfixed gaze away from Madhubala's ethereal visage and to listen to the songs. Naushad extracted a fine performance from Lata in Mohabat ki jhooti kahani pe roye, Hamein kash tum se mohabbat na hoti, Khuda nigh-e-baan ho tumhara, etc. Inspired by a folk song from eastern Uttar Pradesh, Prem kiya kya chori kari hai.., Naushad created a paramount paen to romantic rebellion Pyar kiya to darna kya, Mohe panghat pe Nandlal ched gayo re.. sung by Anarkali dancing like Meera in the palace of Akbar sends the audience in a trance even now. Naushad had recorded 20 songs for Mughal-e-Azam, 10 of them no one ever heard including a classical Shamshad Begum-Mubarak Begum-Lata Mangeshkar number Husn ki baraat chali. Prem jogan ban jaoon.. in the voice of Bade Ghulam Ali Khan remains the most sensual song in Hindi cinema. Situational numbers like Duniyan mein hum aaye hain to jeena hee padega, Nagri nagri dware dware, Umariaya ghati jaye re etc made the music of Mother India a landmark. Ganga-Jamuna tackled a subject from Uttar Pradesh and Naushad infused the score with a folksy rhythm indigenous to the region in Nain lad jaihen toh manva mein kasak hoibe kari, Do hanso ka joda bichad gayo re, Dhoondho re sajana more kaan ka baala, etc. Naushad proved his staying power by giving hits right from Prem Nagar, Rattan, Anmol Ghadi, Shah Jehan, Amar, Deedar, Andaaz in the 1940s to Ram Aur Shyam, Admi, Saathi, etc in the sixties. In between came films Aan, Baiju Bawra, Mother India, Ganga-Jamuna, Mughal-e-Aazam, Kohi-i-noor, to mention only the best. 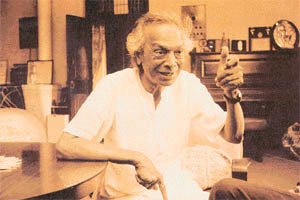 A staunch critic of the influences of Western music, Naushad used Indian classical and folk music in about 67 films. Naushad could handle varied genres of music. Nothing was difficult for him. Be it a romantic number Suhani raat dhal chuki, a ghazal Tasveer banata hoon teri khoon-e-jigar se, a bhajan Madhuban mein Radhika nache re or a patriotic song Apni aazadi ko hum hargiz mita sakte nahin or a qawwali Mehlon mein rehne wali humein tere dar se kiya or a tipsy number Mujhe duniya walo sharabi na samjho..
Shakeel Badayuni, Majrooh, Kumar Barabunki, Madhok, etc toiled to give Naushad their best. Among the singers it was primarily Mohammed Rafi and Lata. From the 1970s, Naushad took a backseat when his scores in Ganwar, Aaina, Dharam Kanta, Teri Payal Mere Geet, Guddu tended to be uncomfortable compromises. The golden melodies that he had created in his heyday endured and remained timeless. Gham diye mustaqil, Jab dil hee toot gaya, Mera jeewan saathi bichad gaya, Na milta gham to barbadi ke afsane kahan jate, Jane wale se mulagaat na hone payee, Yeh kaun aaya, etc were chartbusters in their eras. In his last film Taj Mahal-An Eternal Love Story, Naushad spun enchanting melodies like Mumtaz tujhe dekha, Ajnabi thehro zarra, Apne shaane ko etc. They have his stamp as well as a contemporary flavour. Naushad proved that legends never fade away, but reinvent themselves.